Peaceful and serene in the Skylark Meadows development at San Luis Bay Estates, a gated community in Avila Beach! This meticulously cared for 1983 sq.ft 3 bedroom 2 bath home enjoys privacy with no neighbors on the back and south sides along with many coveted guest parking spaces. A wonderful home for entertaining with a large living room paired with dinning, high ceilings surround sound speakers, skylight and a fabulous Majestic heater rated gas fireplace. A sliding glass door opens onto a wonderful huge deck to relax and enjoy with family and friends, overlooking the majestic oaks and hills while the hawks fly by. Beautiful Bruce oak flooring in the entryway, kitchen and guest bath. A well-appointed kitchen with quality oak cabinetry, Corian counter tops and breakfast nook complete with picture window. Down stairs you'll find the secluded luxurious master suite, cozy fireplace with closets and storage galore, additional sitting room and itâs own private deck. Milgard Low E2 windows throughout for improved insulation and blocking of UV rays. Full 2 car garage with cabinets and storage. 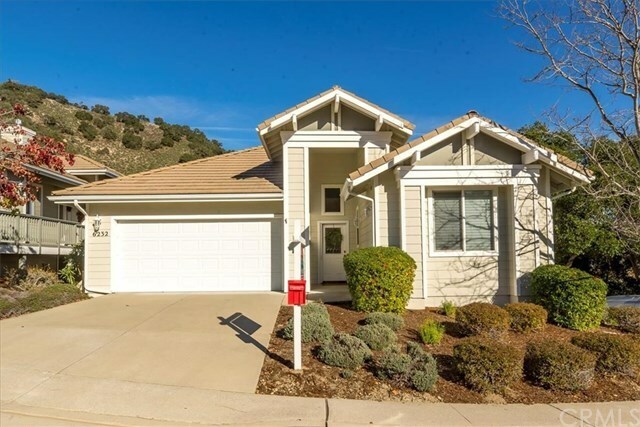 Just minutes to the beach, walking trails, golfing, fitness/tennis club with 2 swimming pools and Edna Valley wine region. An absolutely lovely home just waiting for itâs new owners. Directions: San Luis Bay Drive to San Luis Bay Estates Entrance. From visitor gatehouse, turn right on Lupine Canyon, right onto Sparrow Street, left onto Kestrel Lane.